Solar power is energy from the sun and without its presence all life on earth would end. Solar energy has been looked upon as a serious source of energy for many years because of the vast amounts of energy that are made freely available, if harnessed by modern technology. A simple example of the power of the sun can be seen by using a magnifying glass to focus the suns rays on a piece of paper. Before long the paper ignites into flames. This is one way of using the suns energy, but flames are dangerous and difficult to control. A much safer and practical way of harnessing the suns energy is to use the suns power to heat up water. A magnifying glass can be used to heat up a small amount of water. A short piece of copper tube is sealed at one end and filled with water. A magnifying glass is then used to warm up the pipe. Using more than one magnifying glass will increase the temperature more rapidly. After a relatively short time the temperature of the water increases. Continuing to heat the water will cause water vapour to appear at the top of the tube. In theory, with enough patience, several magnifying glasses and very strong sun light enough heat should be generated to boil the water, producing steam. This is one way of harnessing solar power. The principle of heating water to boiling point was used by the French in 1888. They developed a solar powered printing press. It used the energy of the sun to boil water, producing steam. The steam was used to drive a steam engine which provided the power to drive the mechanical printing press. The machine was unreliable and very expensive to manufacture. Modern solar panels are a combination of magnifying glasses and fluid filled pipes. The solar panel seen opposite has a glass front which is specially made to focus the power of the sun on pipes behind it. The pipes carry a special fluid that heats up rapidly. They are painted black to absorb the heat from the sun. The silver reflective surface behind the pipes reflects sun light back, further heating the pipes and the fluid they contain. The reflective surface also protects anything behind the solar panel (such as a roof). The fluid filled pipe from the solar panel enters the water tank and coils round many times. The heat from the pipes is transferred to the water in the tank. A small device in the tank stirs the water to help with the transfer of the heat from the fluid pipes. to heat domestic water. Although a typical system is expensive to buy, it pays for itself over a period of five to ten years. Also owning and using a system such as this shows that the owner is serious about saving energy and protecting the environment. A typical solar water heating system is seen in the diagram below. The suns rays pass through the glass panel, warming the fluid pipes inside the unit. The pipes are painted black to ensure that they absorb as much heat as possible. The reflective silver surface behinds the pipes reflects heat back onto the pipes, further raising the fluids temperature. The fluid pipes running through the solar panel are sealed and the fluid is pumped round the sealed system. The pipes run through the domestic water tank and the heat they carry is transferred to the water in the tank. The coil of pipes is called a ‘heat exchanger’. of a building where the sun’s rays are not blocked out by trees or other obstructions. Solar panels are quite expensive to manufacture and at the moment they are not widely used in countries such as the UK. Why do you think this is so? Solar power is energy from the sun. Although the sun is 150 million kilometres away it is still extremely powerful. The amount of energy it provides for the earth in one minute is large enough to meet the earth’s energy needs for one year. The problem is in the development of technology that can harness this ‘free’ energy source. Solar collectors are one way of focussing the suns rays to heat up fluids. A typical array of solar collectors is seen opposite. They are basically unusually shaped mirrors (parabolic in shape) that focus the heat of the sun on a pipe carrying a special fluid. The temperature of the fluid in the pipe increases as it flows down the pipe, along the solar collectors. The pipe extends the entire length of the mirrors. This type of set up works at its best in desert areas where there is no shortage of sunlight and very little cloud. The hot fluid in the pipe can be used, through a system of heat exchangers, to produce electricity or hot water. The special fluid inside the pipes can be replaced with water. The concentrated heat from the parabolic collectors turns the water into steam. The jet of steam is used to turn turbines producing electricity. This system works well in desert regions due to the hot climate. 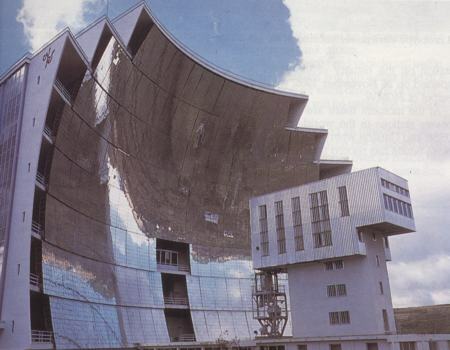 The picture below shows the parabolic reflector of the Odeillo-Font-Romeau Solar Furnace in France. 63 flat mirrors automatically track the sun and concentrate the light on a reflector. The reflector then concentrates the rays to produce 1000 kilowatts and a temperature of 33,000degrees centigrade. This is used to power a furnace producing steel from iron ore.
energy. This is normally provided by electricity, gas or fossil fuels. The solar furnace relies on the power of the sun. The picture below shows how the sun’s rays are focussed on the crucible holding the ore. The ore is heated to a very high temperature until it becomes molten, then it is poured. Pollution is kept to a minimum as solar power is a clean source of energy. 1. Design another industrial application of a parabolic collector system. For example, the system could be used to produce electricity for a remote farm OR produce hot water for a public bathing area. Photovoltaic cells look similar to solar panels but they work in a different way. Solar panels are use to produce hot water or even steam. Photovoltaic panels convert the sunlight directly into electricity. A typical example of a device powered by photovoltaic cells is a solar powered calculator. This type of device only needs a small amount of electrical power to work and can even be used in a room with artificial light (bulbs / fluorescent light). Although we see photovoltaic cells powering small devices such as calculators they have a more practical application especially in the third world. Photovoltaic cells have been developed that will provide electrical power to pump drinking water from wells in remote villages. British Telecom have developed a system that can be used to power a radio telephone system. During the day the cells power the phone and also charge batteries. The batteries power the phone during the night. Often photovoltaic cells are used as a backup to conventional energy. If conventional fails the cells are used to produce electricity. the main material, silicon. The black round and irregular shapes represent the impurities of boron or phosphorous. As the sun/light strikes the cell the impurities free up electrons which ‘bounce’ around at incredible speeds. This creates an electrical charge. 1. Make a list of devices that are powered by photovoltaic cells. 2. Describe devices that you think could be powered by photovoltaic cells (fully powered or as a backup to the electricity power grid). PRACTICAL APPLICATIONS OF PHOTOVOLTAICS ? In the example shown below photovoltaic panels are used to produce electricity which powers a water pump, pumping drinking water from a well. This is especially useful in agriculture and in the third world where wells can be extremely deep. 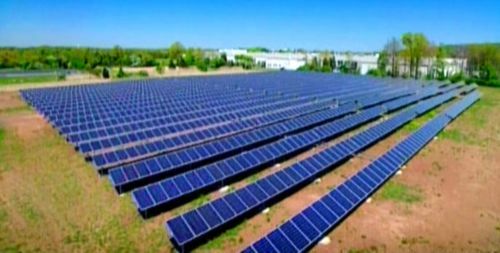 The power produced by the photovoltaic panels is also used to power a purification system, cleaning the water, removing dangerous impurities and harmful bacteria. When not being used to pump water, the electricity can be stored in batteries so that the pump can be used at night. The phone box seen opposite is powered directly by photovoltaic cells during the day. The batteries are also charged during sun light hours. This type of communication system is ideal for remote areas where electricity from the power grid is not available. They have been tested in third world countries and have proved successful. However, the priority for most third world countries is to ensure that people in remote areas have clean drinking water rather than Hi-Tech communication systems. In industrial / developed countries photovoltaic cells are used to power automatic weather stations. Next time you drive down a motorway / highway watch out for photovoltaic systems as they are sometimes used to power electronic systems measuring traffic congestion and traffic flow. The photovoltaic panel is being placed on the roof of a single story house in a village in Africa. The panel will provide enough electrical power for a phone. This is the only phone for a radius of 100 miles. It is an essential tool of communication for the whole village as well as the surrounding area. 1. With the aid of diagrams and notes, describe a new way in which photovoltaic cells could be used to provide power for a useful device. 1. Solar energy is free although there is a cost in the building of ‘collectors’ and other equipment required to convert solar energy into electricity or hot water. 2. Solar energy does not cause pollution. However, solar collectors and other associated equipment / machines are manufactured in factories that in turn cause some pollution. 3. Solar energy can be used in remote areas where it is too expensive to extend the electricity power grid. 4. Many everyday items such as calculators and other low power consuming devices can be powered by solar energy effectively. 5. It is estimated that the worlds oil reserves will last for 30 to 40 years. On the other hand, solar energy is infinite (forever). 1. Solar energy can only be harnessed when it is daytime and sunny. 2. Solar collectors, panels and cells are relatively expensive to manufacture although prices are falling rapidly. 3. Solar power stations can be built but they do not match the power output of similar sized conventional power stations. They are also very expensive. 4. In countries such as the UK, the unreliable climate means that solar energy is also unreliable as a source of energy. Cloudy skies reduce its effectiveness. 5. Large areas of land are required to capture the suns energy. Collectors are usually arranged together especially when electricity is to be produced and used in the same location. 1. What is your opinion of solar energy ? 2. Do you think solar energy will answer the worlds energy crisis ? 3. Does solar power cause any pollution or damage to the environment ? 4. Research the internet to find information / pictures on unusual solar powered devices. Present this information using software of your choice. 5. What devices in the future will be solar powered ? Explain your reasoning. 6. Draw a rich picture with SOLAR ENERGY at its centre. List associated words / themes around this main theme. Add pictures to illustrate and support many of the words / themes. Solar cars have been developed in the last twenty years and are powered by energy from the sun. Although they are not a practical or economic form of transportation at present, in the future they may play a part in reducing our reliance on burning fossil fuels such as petrol and diesel. A solar powered racing car is shown above. These are expensive to produce and usually seat only one or two people. The main cost is due to the large number of expensive and delicate photovoltaic solar panels that are needed to power the vehicle. Also, many of the solar powered cars used in races today are composed of expensive, lightweight materials such as titanium composites. These materials are normally used to manufacture fighter jets. Carbon fibre and fibre glass are also used for much of the bodywork. Most of the cars used in races are hand made by specialist teams and this adds to the expense. A solar powered vehicle can only run efficiently when the sun shines, although most vehicles of this type have a battery backup. Electricity is stored in the batteries when the sun is shining and this power can be used when sun light is restricted (cloudy). The batteries are normally nickel-metal hydride batteries (NiMH), Nickel-Cadmium batteries (NiCd), Lithium ion batteries or Lithium polymer batteries. Common lead acid batteries of the type used in the average family car are too heavy. Solar powered cars normally operate in a range of 80 to 170 volts. To reduce friction with the ground the wheels are extremely narrow and there are usually only three. Some solar powered cars are practical and one is shown below. This is a solar powered golf cart and it can be used in sunny climates to carry golfers from one hole to the next. When it is standing still the solar panels charge up the batteries and it is the batteries that power the electric motors, directly. As the vehicle is not in continuous use the batteries have time to charge up before they are needed. One of the more realistic ways in which that solar powered cars could become practical is to charge up their batteries when they are parked, during the day. Imagine driving the short distance to work and plugging the car into a set of photovoltaic solar panels. Whilst you are working the batteries charge up ready for use for the journey home. The same procedure could be carried out when the car is parked at home. A combination of solar power and wind power may prove to be a method of charging the batteries of ‘electric cars’. A solar powered model racing car can be made quite easily using very basic equipment, tools and materials. A pair of scissors insulation tape, sellotape and a craft knife, for holding some of the components to the straw frame. Two 3 to 6v motors are needed to drive the back wheels and a piece of 2mm compressed polystyrene or PVC. The motors will be taped to the polystyrene using insulation tape. Two rubber wheels with a 1.5/2mm hole through the centre. The wheels will be pushed straight on to the shafts of the motors (friction fit). One /two jumbo art straws, 400mm in length. These will be used to make the basic frame of the vehicle. A plastic wheel will be used for the front of the vehicle. A small 2mm steel axle is also required. A line of electrical connectors are used to connect the wires from the motors to the solar panels and ON/OFF switch. A small electrical screw driver, wire cutters, wire strippers, long nose pliers and soldering iron, for working with the electronics aspect of the project. Cheap solar panels (photovoltaic panels). These will provide the electrical power required to drive the model solar car forward. A toggle switch or similar switch to turn on and off the supply of electricity. An A3 piece of card with the size of the card base and bodywork clearing marked out. If a number of model solar powered cars are to be made, simply photocopy the as many times as necessary. A range of drawing equipment will be needed to add a design and colour scheme to the bodywork of the model car.